The 2015 Anime Expo returns to the Los Angeles Convention Center starting this Thursday and running through Sunday. This annual 4-day expo for all things Anime & Manga attracts exhibitors and fans from across the globe for the largest gathering of its kind in the world. What started as a simple expo for those in the Anime industry has grown to encompass anything remotely related to the art of Japanese art & animation. Today, this large expo now hosts artists, designers, vendors, video game companies, technicians, actors/actresses, voice actors, models, musicians, singers, cosplayers, and much more to spread their work out to the public as well as interact with the fans. With so much to do, so many people to see, and so many people wanting to get in (tens of thousands of visitors on the first day! ), naturally the organizers had to make this expo cover a span of four days every year. As the current world’s largest expo of its kind, one can expect sheer overflow of people in the area for miles. Road traffic does not face as much of a problem, save for the exuberant parking prices that reaches upwards of $40 per vehicle. Pedestrian traffic causes the most headaches, from the uncontrolled crosswalks to the endless line of jaywalkers. If anything definitely terrorizes attendees, the line to enter the expo causes the most grief. From getting in line to getting into the building, the wait on the morning of the 4th of July usually takes hours to enter. Strangely, very few attendees complain about this, as if they accept this year after year. For a first-time attendee like myself, I speak for many other first-time attendees when I say that this expo NEEDS an attendance limit. Comic Con follows an attendance limit, yet still sells out in under a minute every year. Upon questioning some attendees from previous years, they mention that at least a hundred attendees camp overnight, and that entering the line at 8am when the expo opens still takes over an hour to get in. They also mention that the first day always sees the most amount of attendees, which sounds reasonable. Lesson learned: if attending Anime Expo, either attend extremely early on the first day, or attend on the second and/or third day. If you feel that you cannot attend Anime Expo this year, fear not – Anime California comes to Orange County on the weekend of August 28-30. At $45 for the entire weekend, expect to see nearly the same things at Anime Expo. 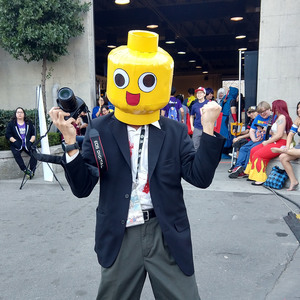 If you desire the massive crowds and content that Anime Expo offers, keep this weekend open for the 2014 Anime Expo at the Los Angeles Convention Center. If you have a costume, wear it proudly and show it off to everyone! The nation’s largest expo & convention for anime & manga returns to Downtown LA this 4th of July weekend. Complete with hundreds of artist & vendor booths, this convention allows attendees to get interactive via the masquerade ball, music videos, concerts, battle of the bands, fashion shows, dancing, video games, karaoke, cosplay gatherings & contests, and much more. Admission varies by the number of days attending – 4 days cost $80, while one day costs $39. Children 6-12 get in for a flat rate of $25, while children 5 and under get in free with a paid adult admission. Some of the special events, such as concerts and maid cafés, requires an additional ticket to get into. Parking at the convention center costs $15, so bring cash for that plus any of the vendors and food inside the convention center. Optionally, park in outdoor third party lots in the surrounding blocks for a lower rate, or take public transportation. At this free and all-ages event this Thursday night, check out cars, local bands, and fireworks. Rock out to some local skacore this Thursday night in West Hollywood. Tickets to this all-ages show cost $12. Legendary punk band The Vandals will headline this show at the Glass House in Pomona this Friday night. Tickets to this all-ages show cost $17.76. Party at the beach this Independence Day in Long Beach. Admission costs $10 for adults and free for kids, and includes all-day reentry, one BBQ plate plus a soft drink, and access to the kids’ play area. Plenty of live bands, a beer garden, boat rides, and more will keep guests entertained all day. Metered parking lots remain enforced in the lots nearby; for long-term parking, I recommend parking in the neighborhoods beyond Ocean Blvd. From the organizers behind Ktown Night Market comes the OC Block Party, a 4th of July extravaganza taking place at Angel Stadium this Saturday. It costs $7 to attend this all-ages celebration, complete with fireworks, live music, food, drinks, vendors, a car show, and more. Bring lots of extra cash with you for parking and other things you may purchase in the event area. Up to no good like always, pirates will swarm all over Belmont Veterans Memorial Pier in Long Beach this weekend for the 2015 Pirate Invasion of Belmont Pier. This free and all-ages event caters to families and kids with the costumed pirates and activities mainly geared towards entertaining children. Many attendees dress up as pirates, and many get into character for the entire duration of their visit. The fair zone includes many vendors, pirate swag, a pirate stage, and ship battles. Down on the dunes, the actual kids area and performance stages makes for a mini fun zone. The main fair zone consists of the entire pier, from start to end. All the primary pirates (actors hired to portray pirates here) mingle throughout the area, occasionally stopping for photos and to pester the attendees with mindless pirate gibberish. The vendors range from selling actual pirate equipment & clothing to the typical commercial vendors like KROQ and Coors Light. Festivities begin at 10am on Saturday and Sunday, and run until 9pm on Saturday and 6pm on Sunday. The beach parking lots all have paid meters, but street parking costs nothing, so you may opt to search for neighborhood parking to alleviate parking costs. If you cannot make it out to the pier this weekend, Alfredo’s Beach Club, the company that organizes the pirate fest, holds TWO pirate fests annually. This one at Belmont Pier always takes place at the beginning of summer and costs nothing to attend. The second one at the end of September at Marina Green by Shoreline Village has a fee to enter. An Orange County original, the 2015 Punk Rock Picnic returns this Saturday to Marina Green in Long Beach after a catastrophe in 2013 and taking 2014 off. Featuring over 60 bands across six stages and extreme sports athletes, this all-day all-ages concert will show that punk rock never died, and lives stronger than ever. As for the reason why they took two years off, basically the organizer bit off more than he could chew in 2013, and the event completely fell apart, leaving hundreds of people concert-less with a $40 piece of paper. Since then, the event received terrible publicity, and many did not expect to ever see anything come back out of it. Luckily, that unexpected day will return this Saturday. Regular admission costs $45, while children 12 and under get in for $25. This event does not allow ins & outs, so make sure that you can endure the sunny weather for the entire day. This time, the concert features a more realistic lineup of bands, many of which hail from Southern California, such as Agent Orange, Angry Samoans, Yeastie Boys, Ill Repute, Agression, The Gears, Shattered Faith, and many more. Of the bands not from Southern California, definitely check out Cockney Rejects, Discharge, and The Meatmen. Personally, I look forward to seeing Amerikan Made, One Less Zero, Whitekaps, Hollywood Hate, and any other band I can squeeze into my day. Regardless of the bands listed here, everyone should really check out as many bands as possible to support the local music scene. I will admit that I have my doubts about returning to this event, but I will give it a second chance to see if they can truly escape the hole that they fell into two years ago, and you should give it a chance too. This past Saturday, the Crossing Foursquare Church in Whittier held their inaugural car show for the ninth year in a row. Free to attend for all ages, this small display of classic cars took over the street and parking lot of this local church, allowing people to freely walk around and gaze upon the classic works of art. In addition to all the cars, local vendors set up to sell food, apparel, trinkets, accessories, car parts, and more. Car enthusiasts would love events like this, despite its small size for a car show. This event made for a great precursor to the Uptown Whittier Car Show that takes place annually in mid-August. If you like cars, remember to check out the Cross Foursquare Church next year, and bookmark August 15th this year for the Uptown Whittier Car Show, also free to attend for all ages. Black Flag performing Rise Above at The Observatory in Santa Ana, CA. Filmed on July 12, 2013. People’s preference for food has changed drastically over the last few years, with a greater shift towards healthier, more natural food. However, the prevalence of chain restaurants has never quite diminished, and chain restaurants continue to endure in almost every corner of the globe. With this much exposure comes the inevitable backlash from the people, including those who work or used to work at a chain restaurant. A public survey asked chain restaurant employees about what customers should never order from their menus, which received a plethora of answers: some good, some bad, and some ugly. Read on to discover the five highest-rated suggestions about what not to order, as told by the people that work at chain restaurants. When operated correctly, everything works fine at Domino’s. However, every franchise location operates differently, so one location may fare better than another. In order to tell, one must inspect the kitchen area upon arrival. Do the ovens appear clean? Do the pizza screens/trays appear clean? Do the employees wash their hands before & after handling any food? Basic cleanliness makes a big difference between a good Domino’s and a bad one. Like many American chain restaurants, Applebee’s does not exactly fit the bill of healthy food. If you somehow find yourself ending up at an Applebee’s, refrain from order the Oriental Chicken Salad. The dressing that comes with it basically consists of sugar and chicken fat. Sure you can get a different dressing instead, but honestly try to avoid Applebee’s at all cost if you value your health at all. Chick-Fil-A prepares most of their food fresh daily. However, the chicken salad mixture not only contains meat of questionable age, but a bunch of other ingredients that may have arrived at that store many months ago. Due to the mixed nature of chicken salad, it may consist of batches of chicken salad of various ages. Chicken salad also lends itself to freezing and reheating, something that they cannot do with the freshly fried or grilled chicken. Stick with sandwiches or salads with fried or grilled chicken. Many fast food restaurants fall into this category, but Sonic abuses this the most. During busy times, fast food workers would forego cleanliness, and start making shakes without first cleaning the machine. This means that people who order milkshakes would get a little bit of the shakes that people ordered prior. Avoid ordering milkshakes during busy times, or at least inspect the kitchen area when you arrive. If the mixing machine looks dirty, or the staff looks busy, do not order milkshakes. I never understood the concept of vegetable burgers. They try to mimic real burgers, but never can taste as good. They almost always require getting chipped out of the freezer and microwaved to defrost. Worst off, these patties then get thrown onto the same grill used for regular meat. Usually, vegetarians and vegans know better than to eat from fast food restaurants. However, those that do may find themselves accidentally developing an unexpected taste for meat. Prohibition represented a dark time in American history. The government taking away something that the people desire only sounds like a plot one would hear of in a movie or television series. During that time, underground/hidden bars cropped up known as speakeasies, representing bars stealthily hidden from the public view, known only to people with connections. When Prohibition got repealed, the need for speakeasies diminished. However, the concept of speakeasies persisted, and patrons who appreciated the theme kept them intact. Nowadays, speakeasies have no reason to exist aside from nostalgia and theming, so places that resembles them receive praise for keeping an old tradition alive, such as Speakeasy Ales & Lagers. As they approach their 18th anniversary, Speakeasy Ales & Lagers keeps the old speakeasy tradition alive by sticking with the theme. Based in San Francisco, locals revere this brewery for not only standing the test of time, but for delivering quality goods to our hands and mouths. Speakeasy has an amazing lineup of brews, all complete with their own art and theme with a story, such as their Payback Porter. Fans of dark beer will love this robust porter, which sits at 7.5% abv. American hops and dark imported malts give this brew its robust strength. Additional flavors in this brew come from English chocolate malts and rolled oats, which yield a dark brown color, roasted malt aroma, strong coffee flavor, and a smooth finish. A solid brew like this drinks well on its own, but for those enjoying Payback Porter with food, it pairs well with sweet flavors, such as barbecue, caramelized onions, or chocolate. If you cannot make it to their 18th anniversary celebration this weekend, honor them by enjoying a cold Speakeasy brew at home. You can acquire their beers at your local bottle shop, such as Total Wine & More. See what they have in store for the craft beer community by liking them on Facebook and following them on Twitter.